You won’t find a more advanced collagen formula with as many effective nutrients and benefits as you’ll see with Ideal Collagen. 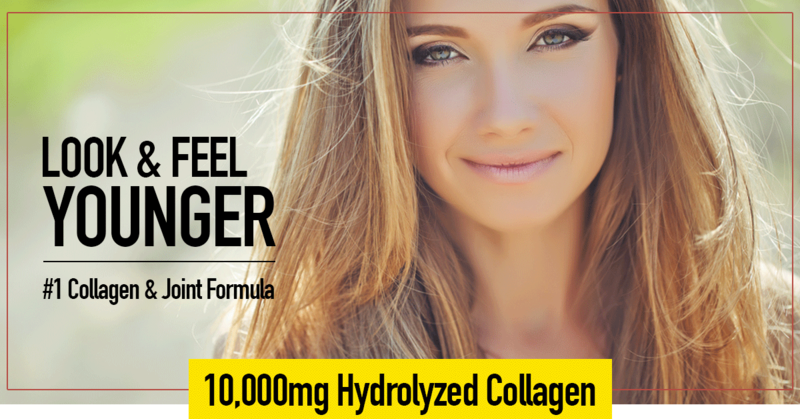 Recapture your youthful look and strengthen your joints with all hydrolyzed collagen has to offer. Ideal Collagen helps support your skin so it looks as vibrant and young as possible while also supporting your joints so you feel agile, mobile and pain-free. Ideal Collagen promotes skin elasticity and lubricates the joints with a revolutionary formula that’s helping people across the globe look and feel years younger. If you’ve noticed wrinkles, dark spots, fine lines, and have painful and achy joints, it might mean your body is telling you it’s time to add more collagen to your diet. With today’s modern eating patterns, most people fail to get enough collagen as they age to maintain healthy-looking, youthful skin. But that’s where Ideal Collagen comes in. Ideal Collagen delivers more collagen in a single formula than any other product so you see results fast because no one enjoys aging. Most people realize the difference Ideal Collagen makes when they start getting comments from friends, family and even strangers. Before you know it, people will be telling you how young you look and you’ll be feeling healthier with less aches and pains too. Ideal Collagen provides the highest-quality forms of collagen in a single, easy-to-mix, and great tasting powdered drink formula with a great citrus flavor. Ideal Collagen was made to strengthen and support the skin, hair, nails and joints as it offers high amounts of hydrolyzed collagen to help reduce and prevent collagen breakdown, promote increased collagen production, and support the health of existing collagen. For decades, the only effective method of increasing collagen was through collagen injections. And while effective, they can be painful and pricey. That turned many to the idea that a cream could do the job. Unfortunately, creams fail to deliver because the collagen can't penetrate the skin. With the revolutionary advancements available through Ideal Collagen, you can say goodbye to injections and ineffective creams. This natural formula works from within to supply the added collagen the skin and joints need so you see a noticeable improvement . 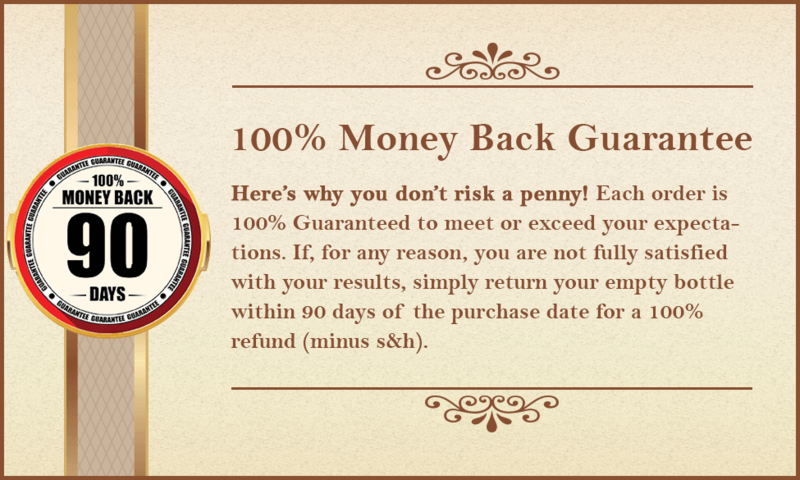 . . 100% GUARANTEED! 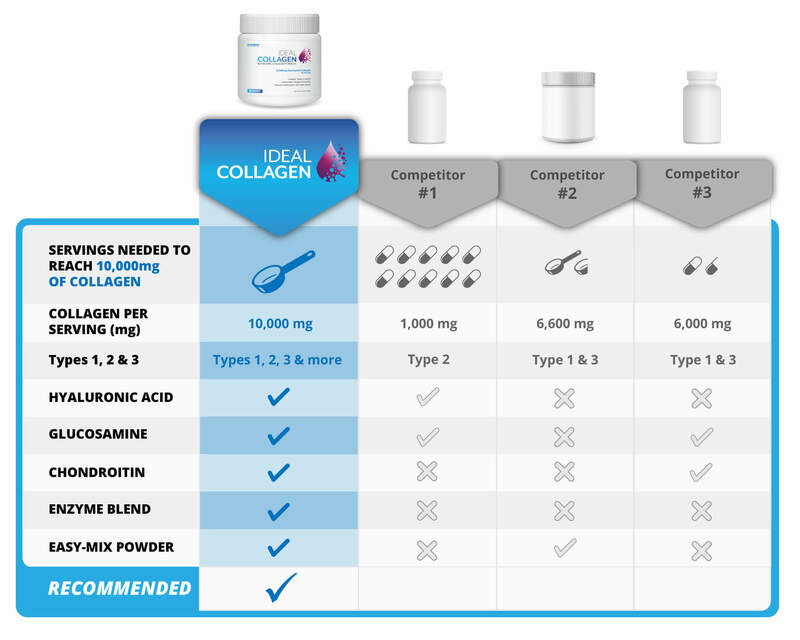 How Ideal Collagen provides the more complete solution for your skin and joints. Each serving of Ideal Collagen not only is packed with the highest concentration of hydrolyzed collagen, but you also get additional ingredients proven to support the health of your skin and joints. And while many collagen supplements taste absolutely awful, this is a sweet, mild, and refreshing wildberry flavor that makes it easy to increase collagen. The body utilizes hyaluronic acid to keep the skin moist while protecting existing collagen by preventing deterioration. Glucosamine sulfate is used to produce added hyaluronic acid while it also protects the skin and joints from free radicals. This natural compound works with glucosamine sulfate to naturally increase hyaluronic acid for added support to the skin and joints. Derived from papaya, papain is an enzyme the body uses to promote activity in collagen-producing cells to help replenish collagen. Derived from pineapples, this enzyme helps reduce inflammation that can lead to unhealthy skin and poor joint health. Protease is another enzyme and it naturally exfoliates the skin to eliminate dead skins cells quickly to help you skin glow. Ideal Collagen offers effective amounts of the key ingredients so users get the results they're looking for in a formula that tastes great! 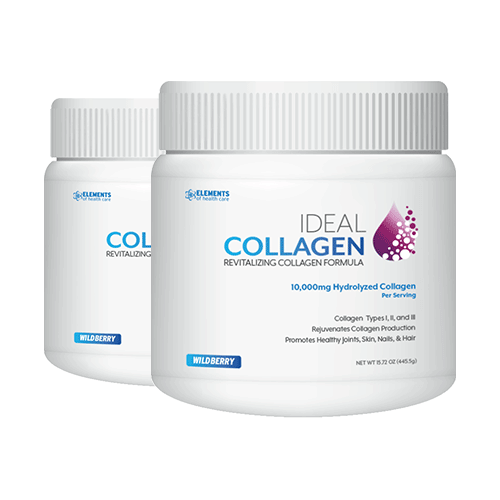 No other formula offers as much collagen so you won't see the same results you'll get with Ideal Collagen. Small amounts of the key ingredients just don't cut it when it comes to fully improving the health and appearance of your skin and health of your joints. Just take a look at the difference you'll get with Ideal Collagen. What's In Ideal Collagen™ Revitalizing Collagen Formula? 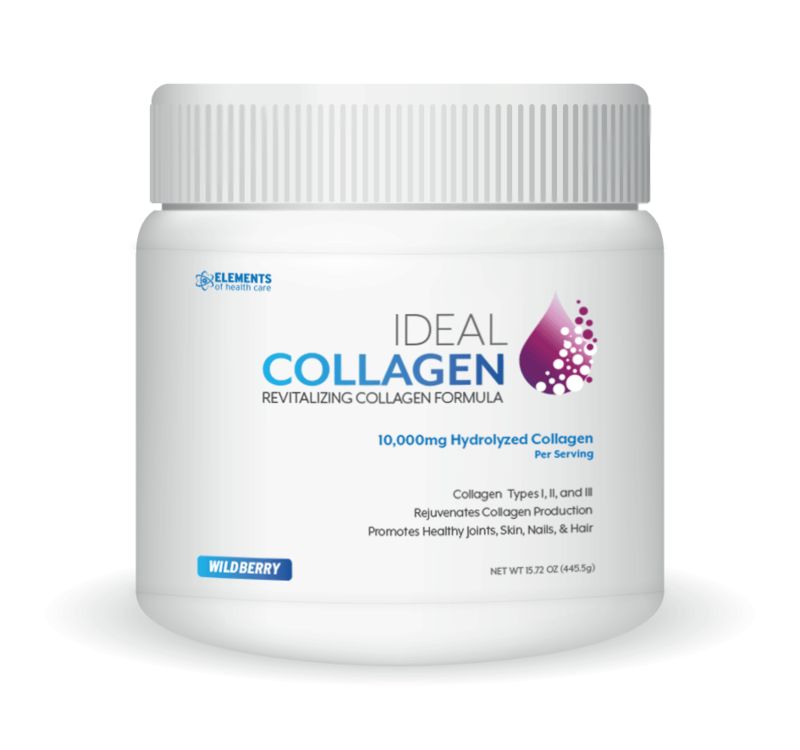 Directions for Ideal Collagen: Mix a scoop of Ideal Collagen with 16 oz. of cold water or juice until the powder is dissolved. To avoid clumping, use a shaker bottle. Q. What is Ideal Collagen Revitalizing Collagen Formula? A. Ideal Collagen is a powder drink mix that mixes with water or juice. Take Ideal Collagen to support the health and look of your skin and the health of your joints. Ideal Collagen combines collagen with additional vitamins and minerals to offer support for your skin and joints. Q. What is the flavor of Ideal Collagen Revitalizing Collagen Formula? A. Ideal Collagen is a powder drink mix with a great-tasting wildberry flavor that's easy to mix with water or perfect for mixing with smoothies. Q. What are the Ingredients in Ideal Collagen? A. 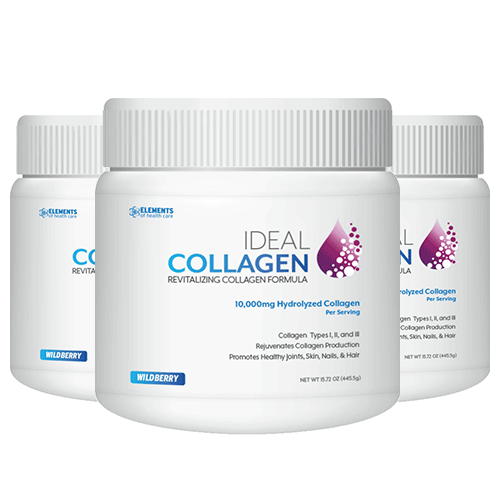 Ideal Collagen is a combination of 10,000mg of hydrolyzed collagen with types I, II, and III collagen along with natural vitamins and minerals that support the health of your skin and joints more powerfully than anything else on the market. Q. 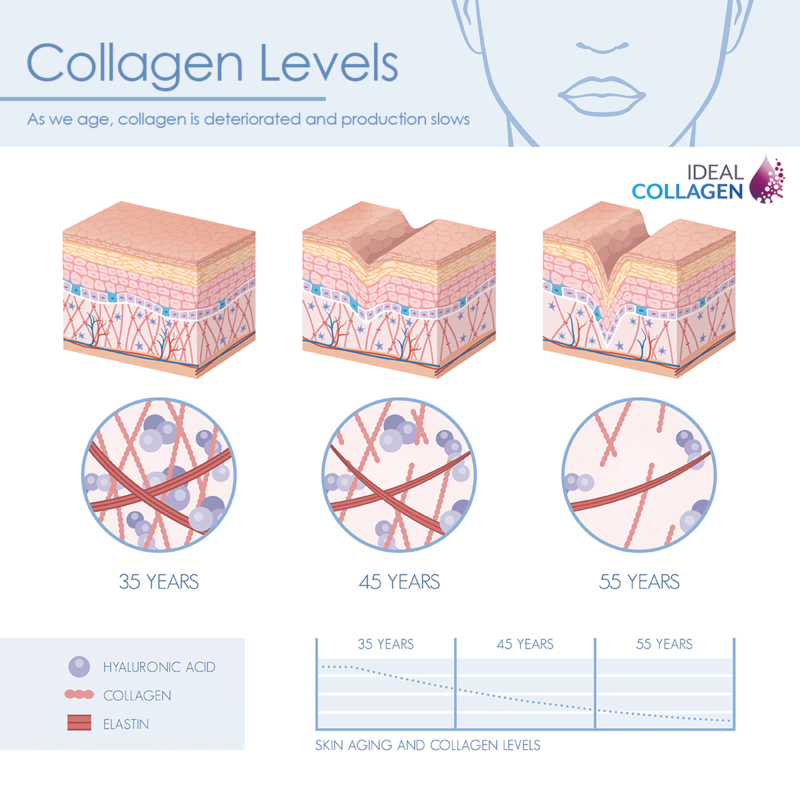 What is the Source of Collagen in Ideal Collagen? A. Ideal Collagen is made with bovine collagen from pasture-raised, grass-fed cattle that are raised free of Rbgh and pesticides. Q. 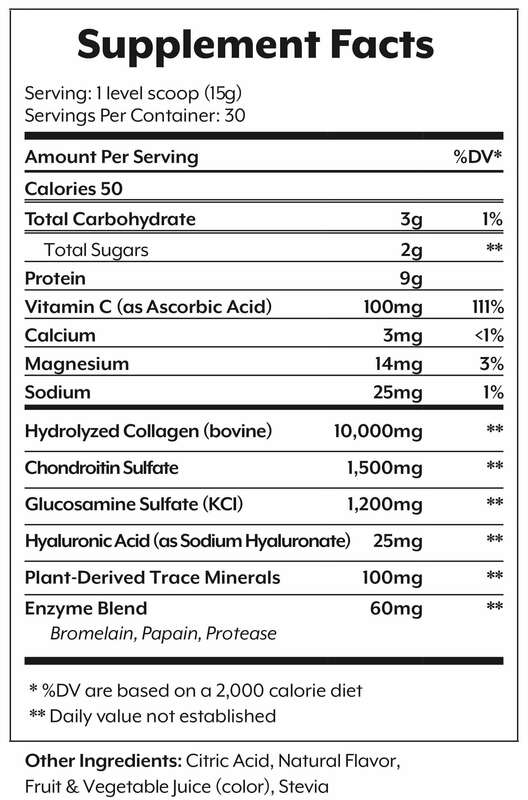 Is Ideal Collagen Gluten Free and non-GMO? A. Yes, Ideal Collagen is gluten free and verified by a third-party lab as non-GMO. Q. How Long Does a Bottle of Ideal Collagen Last? A. Each bottle of Ideal Collagen includes 30 servings and should last about a month. Q. How Do You Use Ideal Collagen? A. 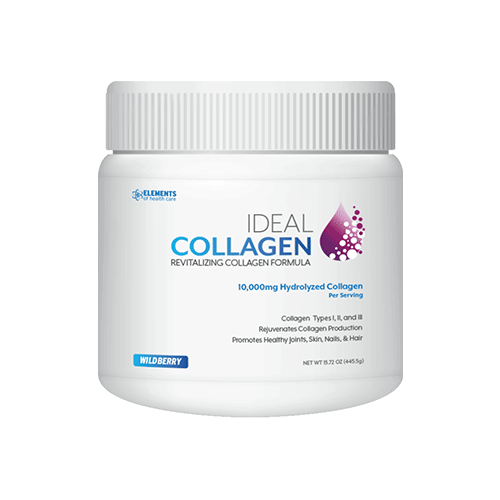 Mix one scoop of Ideal Collagen with 4 to 8 oz. of water or juice until the powder dissolves. Mix with additional water if necessary to dilute to desired taste. Ideal Collagen can also be added to both hot and cold beverages including smoothies and juice. Q. How Can I Make Ideal Collagen Mix Easier? A. To ensure your Ideal Collagen mixes effectively, use a shaker bottle or blender to mix until dissolved. Q. How Many Calories are in Each Serving of Ideal Collagen? A. Each serving contains 50 calories. Q. Are There Any Side Effects that Come with Ideal Collagen? A. There have been no reported side effects of taking Ideal Collagen. If you are allergic to shellfish, it’s important to note there is glucosamine and chondroitin in the formula. If you have been adversely affected by any of the ingredients, avoid use.